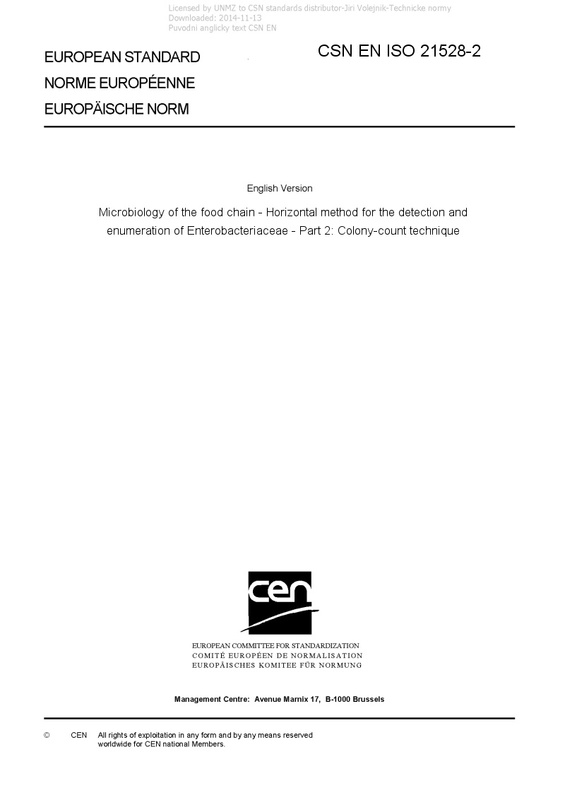 EN ISO 21528-2 Microbiology of the food chain - Horizontal method for the detection and enumeration of Enterobacteriaceae - Part 2: Colony-count technique - ISO 21528-2:2017 specifies a method for the enumeration of Enterobacteriaceae. It is applicable to - products intended for human consumption and the feeding of animals, and - environmental samples in the area of primary production, food production and food handling. This technique is intended to be used when the number of colonies sought is expected to be more than 100 per millilitre or per gram of the test sample. The most probable number (MPN) technique, as included in ISO 21528-1, is generally used when the number sought is expected to be below 100 per millilitre or per gram of test sample.